Women’s Press, Toronto, Canada, 1990. This is a great little book and it could be your introduction to a situation that you might encounter when your child starts school. Asha and her classmates are excited about the trip their class will soon be taking to the Science Center. But there is a problem. Asha’s permission slip is signed by two mums and Ms. Samuels, her teacher, wants to know which one of the names on the form belongs to Asha’s mother. “Both,” Asha responds. But Ms. Samuels informs her, “You can’t have two mums”. 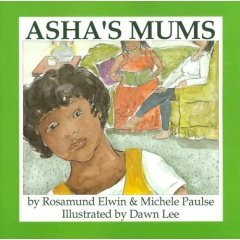 The book is written by two Canadian women of color, Rosamund Elwin and Michele Paulse. The multicultural watercolor pictures were painted by Dawn Lee.